Today’s readings remind me of the highly cryptic and absurdist play written by Irish Nobel laureate and novelist, Samuel Beckett, “Waiting for Godot.” It is a tale that involves two characters, Vladimir and Estragon, who wait endlessly and in vain for someone named Godot to arrive. They distract themselves while they wait expectantly and in vain for the play’s namesake to arrive. 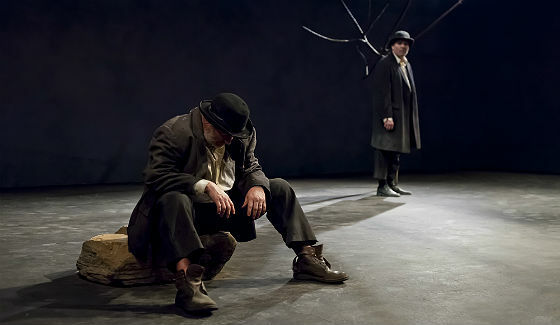 To occupy themselves, they eat, sleep, converse, argue, sing, play games, exercise, swap hats, and contemplate suicide – anything “to hold the terrible silence at bay.” At the end of the story, Godot does not appear, thus reinforcing the futility of the waiting. In fact, one may be led to think that Godot may actually not exist. It doesn’t take an Einstein to note that the name ‘Godot’ sounds too oddly familiar and similar to ‘God.’ Thus, the play can be read as a post-modernist critique of Christian hope, a parody of humanity who waits in vain for the coming of God, who chooses not to reveal Himself at the end. It seems to reinforce what many atheists are saying to us - there is no point waiting for Christ coming, he isn’t coming, no one’s coming to deliver you, don’t waste your time, God may not even exist, there is no HOPE! It is interesting that such a play, brilliant as it may be, with an equally bleak setting, should be voted the most significant English play of the 20th century. Is this an indication of how far we have descended into a state of hopelessness or does it reveal a society that has grown cynical with waiting for deliverance? Advent celebrates primarily two comings – the first coming of Christ in Bethlehem over two thousand years ago. The incarnation, the Word of God taking flesh, seems to be a fulfillment of what the Prophet Isaiah writes in today’s first reading – it is the prophecy of how the Lord “would tear the heavens open and come down.” The whole of humanity who had waited for aeons for the coming of its deliverer, its new Joshua who will lead them to the Promised Land, is not disappointed, as the Saviour has indeed come – He is Jesus the Christ. But Advent does not only prepare us for that first coming which we commemorate every year at the Feast of Christmas but also points us to the future, to Christ’s second coming in glory, to judge and deliver the world from sin, evil and death. Our Christian faith is eschatological to its core. What do I mean by eschatological? The word ‘eschatology’ refers to the Last Things that we had learnt in our catechism – heaven, hell, death and judgment, the four eschata. But the real focus of eschatology is the Last Thing, which is not exactly a thing, in the sense of being an event or an object – it is God himself, the Eschaton. God is the source and summit of our lives, He is the beginning and the end, the Alpha and the Omega. It is Him who we await, not just the end of the story. Eschatology is not purely confined to these vague, deeply profound and theological concepts of the future. Eschatology has everything to do with our present lives. This eschatological vision shapes our Christian world-view. It reminds us that our objective and purpose in life does not reside in the past or even in the present, it is posited in the future. The final solution would not be found here in this life – the final solution can only be found in God. It tears us away from navel-gazing, from self-idolatry, and draws our attention to that which lies beyond the horizon, Christ, who is the Alpha, and the Omega, the beginning and end of everything. Finally, eschatology teaches us to be watchful. What does it mean to be watchful? What does the Lord mean when He tells His disciples to ‘be on (their) guard,’ and ‘stay awake’? Humans are great voyeurs. We enjoy watching, especially what pleases the eye. A beautiful woman or a handsome man would often elicit a second look or even a prolonged gaze. We watch for market trends in order to ensure that we are ahead of things economically and financially. We watch for pitfalls and obstacles especially when we are negotiating a difficult path or engaging in a new project. Some of us enjoy watching for the faults of others and gleefully jump at the opportunity to catch them when they make a mistake. But is this the kind of watchfulness which the Lord is speaking of? I guess that these are more distractions rather than authentic watchfulness. We are invited by the readings to watch for the Lord, and especially for His coming. Firstly, this requires patience because as Jesus noted, ‘you never know when the time will come.’ The problem is that our attention span is often too short. We constantly look for distractions or loose interest when results are not immediately forthcoming. In a world that seeks immediate gratification, quick final solutions are the only acceptable options. Patience teaches us to respect God’s time and not dictate it. Watchfulness calls for fidelity or faithfulness to our duty. Take note that in today’s gospel, the image of the master entrusting the servants with a duty to watch for his coming, reminds all of us that being watchful is not just merely an individual vocation. The servants’ lack of watchfulness may cost the entire household its property or even the life of its members. We are called to be watchful not only for ourselves, but also for our family members, our children, future generations, our neighbours, our BEC members, our non-Christian friends, colleagues and everyone else. If we let our guard down, others apart from us will suffer too. The third aspect of this watchfulness is expounded by St Paul in the second reading. He exhorts the Corinthians that while waiting for the Lord’s coming, to keep ready and without blame until the last day.’ Staying awake and being watchful means that we need to guard against sin. Sin dulls our senses to the promptings of God. Sin blinds us from recognising Christ in our lives. Sin distracts us from waiting and watching for the Lord. That is why Advent is also a penitential period for the whole Church. It is a time for us to honestly search our hearts, seek the Lord’s forgiveness, celebrate His mercy and the gift of repentance in order to make ready the way for the Lord’s coming. Advent is the season of longing, of hope, of desire that we will come to perceive God face-to-face, no longer dimly through a mirror. Unlike Vladimir and Estragon who seem to have waited in vain for the mysterious Godot whom they do not know, Christians, on the other hand, are waiting in hope for Christ whom they do know. Our Christian waiting is never in vain. Christ will come. But will He find us ready, on guard and awake? Rather than to fill our time waiting with self-absorbed activities and distractions that will “hold the terrible silence at bay,” let our season of Advent be one of watchfulness, fidelity, patience and finally contrition that we may find within the silence of our hearts the voice of God, who sends His son to be our liberation and our salvation.